The Labservative candidate created by the Liberal Democrats is going places. 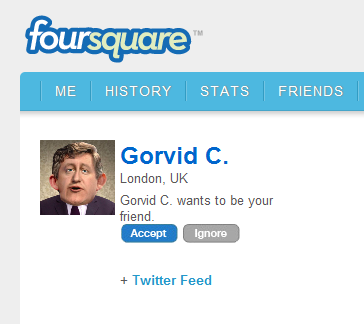 In fact, Gorvid Camerown is on Foursquare (and wants to follow me). He's currently at Number 10 Downing Street. It'll be interesting to see how much noise the fictional character makes and shares with his followers as he does fictional check-ins. Nevertheless; a nice touch.